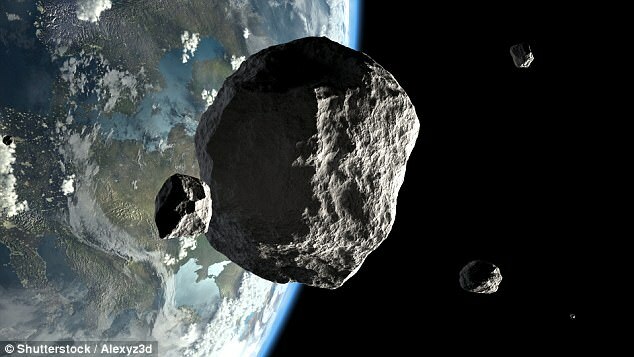 A newly-found bus-sized asteroid is due to come 'close' to Earth today - at speeds of more than 21,000mph (34,000km/h). 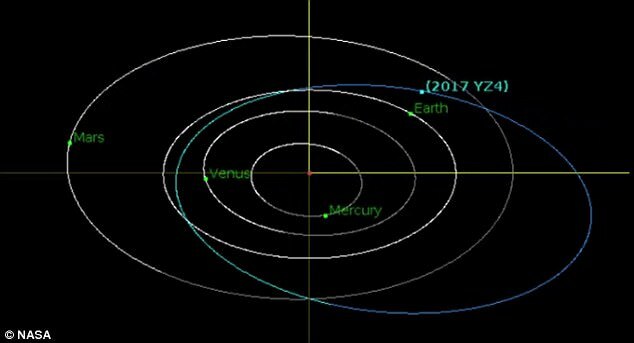 Named 2017 YZ4, the asteroid was only spotted on Christmas Day, which means very little could have been done to protect Earth if it were to hit. The asteroid will pass between the Earth and moon at a distance of just 139,433 miles (224,000 km) - close enough to be considered a 'near miss' by astronomers. The potentially hazardous asteroid, which is 22.6 to 49 feet in diameter (seven to 15 metres) is due to skim past Earth at 4.56pm GMT (11.56 ET) this afternoon. Nasa describes asteroids as 'hazardous' if they come within the 4,600,000 mile (7,403,00km) threshold of proximity to our planet. The asteroid was first spotted at Mount Lemmon Survey Observatory in Arizona and will be the 52nd to pass between Earth and the moon this year. 'This is the first known asteroid to flyby Earth within one lunar distance since two such asteroids flew past us 35 minutes apart on November 21, and the 52nd this year', a Nasa spokesperson told the Express. 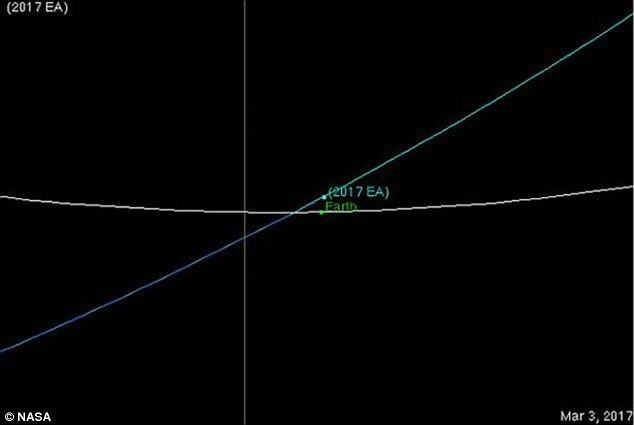 Named 2017 YZ4, the asteroid was only spotted on Christmas Day and will pass between the Earth and moon at a distance of just 139,433 miles (224,000km) - close enough to be considered a near miss by astronomers. For reference, the distance between the Earth and the moon is 238,855 miles (384,400 km). The small asteroid, which is 22.6 to 49 feet in diameter (seven to 15 metres) is due to skim past Earth at 4.56pm GMT (11.56 ET) this afternoon. Anything that flies closer than six million miles of our planet is a near earth asteroid and could cause severe damage were it ever to crash into Earth. In February 2013 a 19-metre meter (62-feet) meteor exploded in the skies above Chelyabinsk in Russia. The energy - which was equivalent to 500,000 tonnes of TNT - and injured more than 1,000 people. Deflecting an asteroid that is on an impact course with Earth requires changing the velocity of the object by less than an inch per second years in advance of the predicted impact. Earlier this month a massive asteroid called 3200 Phaethon made its closest approach to Earth at around 6.4 million miles (10.3 million kilometers) away. The new observations conducted from December 15-19 show Phaethon to be about 3.6 miles (six kilometres) wide. This means it's larger than previously thought, by about 0.6 miles (one kilometre). It passed by Earth this month at about 27 times the distance between our planet and the moon. The latest approach is the closest the asteroid has been to Earth since December 16, 1974, when it was around 5 million miles away - although we were blissfully unaware at the time. The next pass is predicted to be in 2093 when it is expected to pass at just over 1.8 million miles (2.9 million kilometres) away.